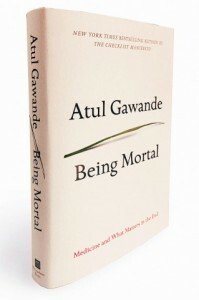 In his new book, Being Mortal, Atul Gawande holds up the Green House® Project and its creator Dr. Bill Thomas, as bright, imaginative, perhaps radical leaders in the field of long term care. As White Oak Cottages is a Green House Home adopter, this accolade brings great pride. Dr. Gawande is a surgeon, Harvard Medical School professor, The New Yorker staff writer, and recipient of many awards and honors. His writings are known for their unflinching look at some of the thorniest issues in medicine. Being Mortal covers the spectrum of challenges that arise as people age and experience a slow, but relentless decline. He details the stories of several elders whose declining function eventually results in a move to an institutional setting. In his interviews with these elders, it is very clear is that they still have a strong sense of self, a need to belong to a community, and a desire for companionship and intellectual stimulation. Unfortunately, most nursing homes fail to provide any support for these needs. In tracing the history of the nursing home, Dr. Gawande explains that they were created not to address the needs of the elderly, but to solve a problem for the hospitals. In the 1950s, hospitals did not know what to do with elderly patients with chronic conditions that had no medical cure who were taking up many hospital beds. The nursing home was created along the same lines as the hospital, so that hospitals could transfer these elders and free up hospital beds for patients with curable medical problems. There is an implicit contract people make when they are hospitalized. They give up their privacy, their regular schedule, food preferences and most other attributes of normal living in order to allow the medical staff to care for them most efficiently. It is a trade off: short term loss of autonomy and normalcy in return for efficient medical care. But what happens when the patient cannot be cured, and cannot live independently? When the patient ends up in a nursing home? Shouldn’t the nursing home model, recognizing the long-term nature of this new arrangement, give the patient back some of the attributes of his or her former life? Alas, nursing homes continue to be based on a medical model, and focus primarily on the health and safety of the patients, not on the quality of their day-to-day lives. Dr. Gawande visited several nursing homes that are trying to transform the industry, including a Green House home. There he interviewed a 94-year-old patient, Lou Sanders. Lou loved a lot about the Green House model: that he had his own bedroom with his own furniture; that he could rise in the morning and go to sleep at night when he wanted; that the staff was willing to let him walk with a walker and not consign him to a wheelchair, even though he had fainting spells. Being Mortal covers much more than the need for nursing home reform. It is a “must read” for families confronting age-related loss of function or potential end of life decision making. Hopefully this book will start a national dialogue on the many things we need to do differently in addressing aging and mortality. For those of us on the front lines seeking changes in how we deal with aging, it is great to be recognized for our efforts to do things differently, and better. Next Article: How Long Do You Want to Live?